Morris Dowton, a Lotus man since the Cheshunt days, was head of manufacturing for the original Elise. He recalled how the car was made ready for production in record time: 'One of the reasons it was so quick was the integration of the manufacturing guys with Tony Shute's team to help develop the car. 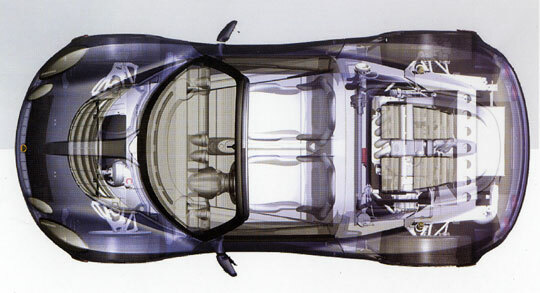 Building an Elise was almost like putting together a giant Meccano set, more assembly than construction, but the factory was keen to maintain the quality standards reached during production of the M100 Elan, gaining the QS 9000 quality management rating in 1998. Some panels, such as doors, bonnet, windscreen frame and sills, could be made using the quicker and less labourintensive VARI (vacuum assisted resin injection) process, developed for the 1974 Elite. This method involves spraying the gel coat on to a female mould, laying the matting and then fitting a male mould and creating a vacuum into which liquid resin can be injected. The stronger crash structure was made by the more costly high-pressure resin transfer moulding (RTM) system. Once a set of panels had been produced it was taken to the machining area where a high-power water jet trimmed imperfections and cut apertures such as the headlamp holes. After final tidying by hand the panels then moved to the paint shop to be primed, painted and lacquered then baked in an oven to cure the finish. A check for blemishes under daylight inspection lighting was made before they could be sent to the assembly line. Early chassis production was at the Hydro plant in Tonder, southern Denmark, but from 1998 it transferred to the new Hydro factory in Worcester, reducing costs and complications. The construction process and bonding techniques were conceived by Lotus, but carried out by the experts at Hydro. Once the aluminium had been extruded and machined, it was anodised to pre-treat the surface before the adhesive was applied and the structure assembled in a jig. The bonds were executed in a controlled environment with careful monitoring of temperature and humidity to ensure every bond was perfect, before the rivets could be applied and the structure removed from the jig for the adhesive to be oven-cured. Steel parts such as wishbones and rear subframes were machined at Hethel, with pressings stamped by computercontrolled tools and welded in jigs by trained operatives, before being sent away to be zinc galvanised. Lotus-made and sourced parts met the chassis in the assembly area, more a progressive coming-together of components than the automated approach of motor industry big boys. The chassis was mounted in a rotating frame and first the wiring loom, then the steering rack, pedal box, handbrake, gear linkage and fuel tank and lines were fitted. Once the rear subfirame was in place the Kseries engine could be lowered in and the suspension, brakes and roll bar added. Next, the glue came out again to bond in the crash structure, windscreen and body, which aligned on special pick-ups designed-in as part of the extrusions. The clamshells themselves were fitted with lights and grilles on a sub-assembly before meeting the chassis. With the body in place, the suspension was aligned, a job made significantly easier by the Hunter rig, which accurately aligned the wheels using hub-mounted sensors. The in-house moulded doors and seats, as well as soft-tops and vacuummoulded plastic parts, were hand-finished in separate sub assemblies before being fitted on the line. Once completed, the car was checked over, fired up and taken for a shakedown on the track before being tested for leaks. Twice a week, a car was selected at random to be given a full quality audit both in the factory under the daylight quality lights and out on the track to ensure standards remained as high as possible. The United States government can provide an exemption to a car maker for parts that are not in compliance. These exemptions are a matter of public record. The exemption for the Elise provides some interesting information. 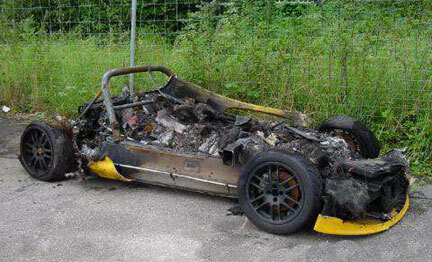 Someone asked on the Lotus List about how safe the Lotus Elise might be? I was often asked the same question when driving my Caterham Seven. The car is light, very small (not visible), and has no modern protection like door beams, air bags, or roll over switches to turn off the fuel pump in case of an accident. I made the car as safe as possible by installing a four point harness, retaining the roll over bar, and installing a fire extinguisher. I also believe the car is nimble enough to help me avoid most accidents. However, if an accident were to happen, there was little that will protect me. A large, heavy car will drive over me, smash in what little there is on the side and crush me. An Elise is better because there are significant frame members along the sides and the front struction is designed to crush and absorb the impact. 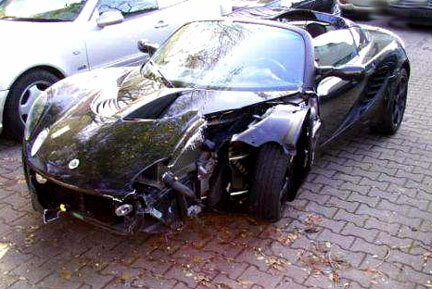 The car is nimble so many accidents can be avoided. However it is still small, light, and low to the ground. There is no substitute for driving defensively and carefully. Fire, I wonder what caused the it? Notice how the front wheel went straight back and did not intrude into the passenger comparmtment. Perhaps the frame rail protected the driver?